Alchemist is partnering with the Sacramento Native American Health Center (SNAHC) to run a Fruit and Vegetable Prescription Program (FVRx) to promote fruit and vegetable consumption to their clinic patients via farmers’ market vouchers. This program serves to engage the clinicians with their patients in their own treatment regarding healthy eating by utilizing the strong “Farm-to-Fork” movement in Sacramento. The clinicians and wellness educators give patients “prescriptions” to purchase fresh produce from farmers’ markets. 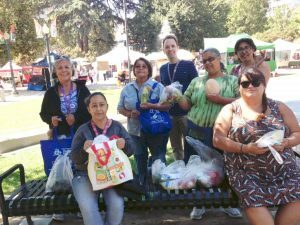 Patients fill their prescriptions at Alchemist’s CalFresh booths at participating farmers markets by exchanging them for vouchers for free produce at the market. Alchemist also runs farmers’ market tours for patients, to familiarize and educate them on healthy seasonal produce. Patients then return to the clinic office for additional “prescriptions” and follow up nutrition education and wellness programs.